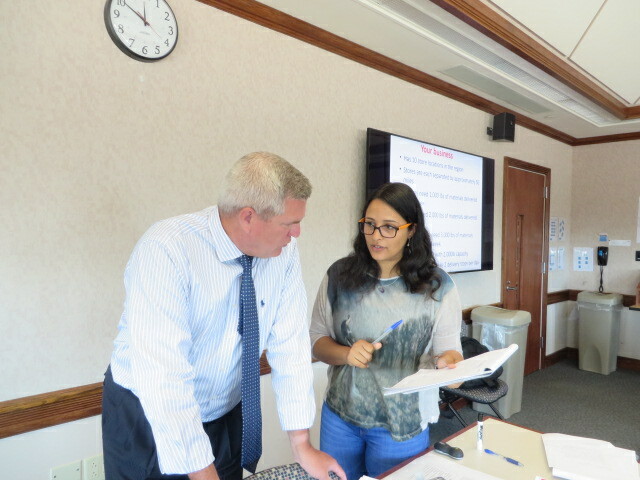 McCormack conferring with a student in class. Adam and Guy list facts of business life that students should take away or adapt from college. These lists provide some of the lessons I try to cover in my courses, and the career manifesto. I urge my students to think about and learn from these lessons, going beyond the classroom as they set off on their business careers. I go off the text book track a lot in class, because business, career and life paths are not set by the text book. The biggest take away form Adam’s post is that you have to do more than your professors ask, you can’t just go along and get along, you have to apply yourself more. Engage and learn some lessons so that when you hit pavement after graduation, you hit the ground running. I start every class asking students what they hope to get out of the course, and I ask them if they are ready to lean forward, and learn, and contribute to class, or sit back and just watch. You are responsible for your own education and career. You can sit there and let it happen, or you can step up, get involved, learn, adapt, improvise and make the knowledge your own. Make yourself valuable in class and work, add something, be vital, as Seth Godin says, “Be a linchpin”. Part of that learning and adapting is reading and learning beyond the assigned text. Find and follow thought leaders like Adam Toren, Seth Godin, Guy Kawasaki, Andy Kessler, and others. You’re responsible for your learning, so as we start the new school year, get busy learning or get busy leaving. Here is a bonus secret for you; the professor doesn’t know everything. But, they will inquire and learn. You should follow that example as you learn and prepare to move onto your business career.